Then he went out and bought an AR-15. Mark Kelly wrote about his AR-15 purchase on his Facebook page. Now the gun shop where Kelly bought his gun has decided to rescind its sale to the former astronaut. 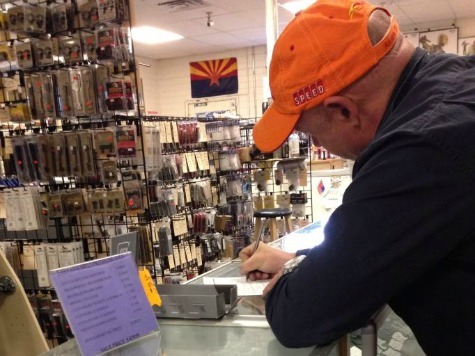 A Tucson gun store owner has decided to rescind the sale of a military-style rifle to Mark Kelly, the husband of former U.S. Rep. Gabrielle Giffords, after Kelly said he had intended the purchase to make a political point about how easy it is to obtain the kind of firearms he’s lobbying Congress to ban. Kelly’s March 5 purchase of an AR-15-style rifle and a 45.-caliber handgun at Diamondback Police Supply sparked a frenzy of reaction from both sides of the debate after he posted to Facebook a photo of himself shopping. A background check took only a matter of minutes to complete, Kelly said in the Facebook post, adding that it’s scary to think people can buy similar guns without background checks at gun shows or on the Internet. But Kelly couldn’t immediately take possession of the rifle because the shop had bought it from a customer. As a result, the store is required by a Tucson ordinance to hold the gun for 20 days to give the city enough time to make sure the weapon wasn’t used in a crime. For the record… Mark Kelly may have committed a felony when he purchased his AR-15 by being a “straw purchaser” and committing perjury on the BATF form.